An Ordinary Life : Science experiment: The Balloon Jet! Science experiment: The Balloon Jet! We have our science group on Monday and although I have all I need I do like to try out the experiments and make sure that it's all going to work on the day. Today I added to our list of air pressure with one I've been wanting to do for a while now. Can you see how much Honi loved it? 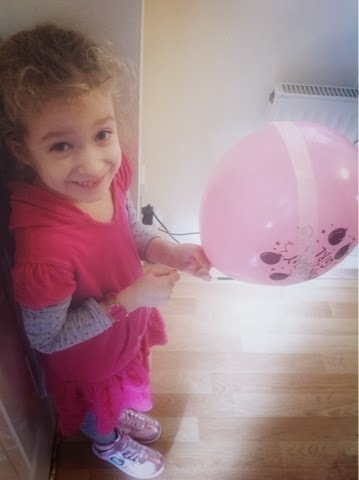 The masking tape ripped a couple of our balloons and Honi wanted to try it out so many times I had to buy some new ones today but that's a good sign: it was a hit! And they learnt a lot about Newton's First Law of Motion which has to be a good thing! 2 people or a door handle and a person! Cut 5 metres of string either tie a double knot at one end or tie it around a door handle. 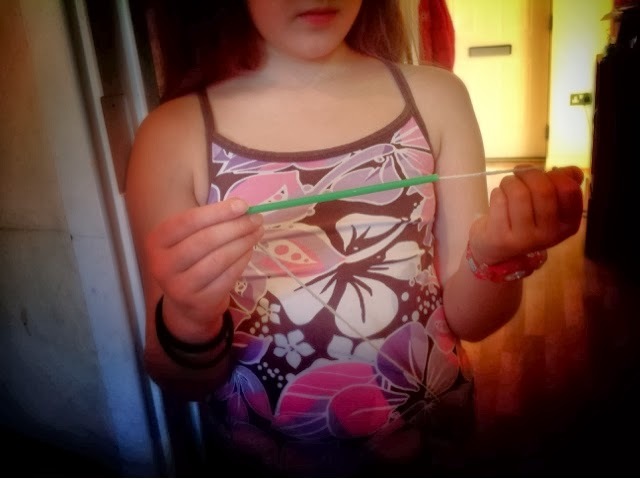 Thread a straw onto the string. Hold the end of the balloon so the air doesn't escape and then, using the tape, stick your blown up balloon to the straw you might find that you need to do this in two to three places, we got away with once in this shot. Let go of the balloon. 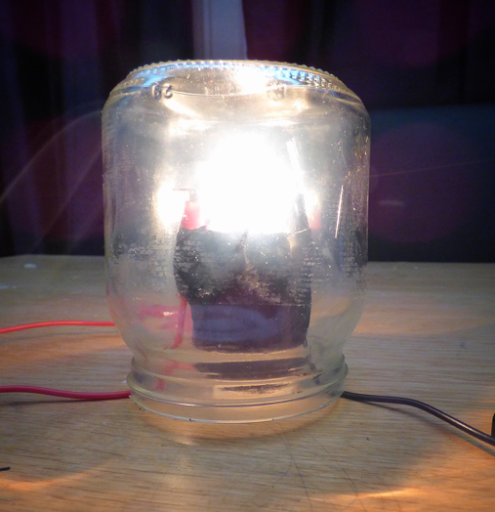 Well it works because of something called jet propulsion. Jet propulsion is thrust that is created by a passing jet stream (usually air or water) in the opposite direction to the direction of the motion in accordance to Newton's third Law of Motion. Newton's Third law of Motion: When one body puts a force on a second body and the second body simultaneously puts a force that is equal in magnitude and opposite in direction to that of the first body. Or, more simply, for every action there is an equal and an opposite action! The air in the balloon is gas under pressure. The air is what has inflated the balloon by pushing it out but there is another force too, the force of the balloon pushing on the air. When air and water is trapped in this way it will always try to escape in our balloon's case that is out of the opening! Does it matter how taut the string is? Why do you think it makes a difference? Does the type of string (wool, string or fishing wire) make a difference to how far the balloon travels? It does all make a difference and the difference is the amount of friction involved. The less friction the further your balloon with travel! Measure how far the balloon travels along the string each time you change one thing, like the type of string or you may like to experiment with how much air you pump into your balloon. You could try quarter full, half full and completely full. Or you could try different shaped balloons. Why would the shape affect the distance it will travel? You might want to take a look here for a hint... Aerodynamics! NEW scientific words and phrases to remember! Newton's 3rd Law of motion: Every action has an equal and opposite reaction!